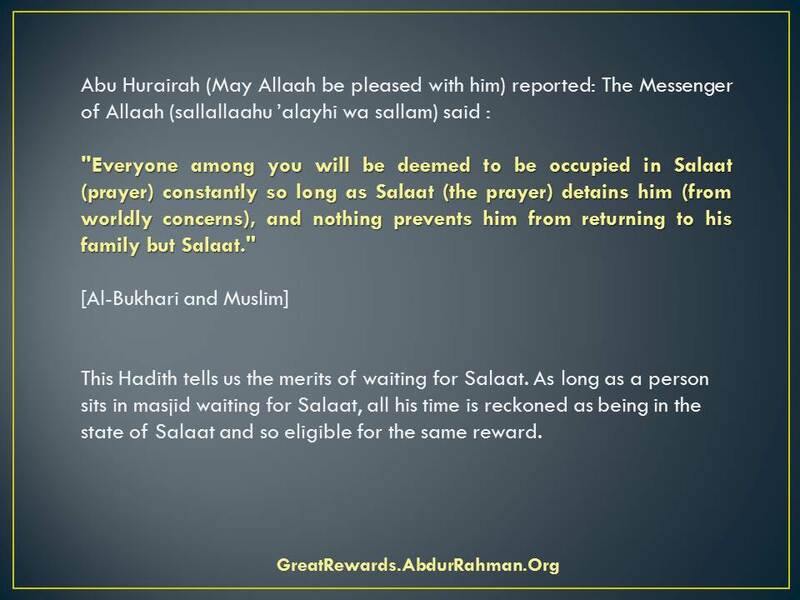 Commentary: This Hadith tells us the merits of waiting for Salat. As long as a person sits in mosque waiting for Salat, all his time is reckoned as being in the state of Salat and so eligible for the same reward. Posted from : Imam Al-Nawawi’s Riyad-us-Saliheen, Chapter 190, The Excellence of waiting for As-Salat (The Prayer) , Published by Dar-us-Salam . Abu Dharr (May Allah be pleased with him)reported: The Prophet (sallallaahu ’alayhi wa sallam) said, “In the morning, charity is due on every joint bone of the body of everyone of you. Every utterance of Allah’s Glorification (i.e., saying Subhan Allah) is an act of charity, and every utterance of His Praise (i.e., saying Al-hamdu lillah) is an act of charity and every utterance of declaration of His Greatness (i.e., saying La ilaha illAllah) is an act of charity; and enjoining M`aruf (good) is an act of charity, and forbidding Munkar (evil) is an act of charity, and two Rak`ah Duha prayers which one performs in the forenoon is equal to all this (in reward).” [Muslim]. Commentary: “Charity is due from every joint bone” means that when a person gets up in the morning, it is obligatory for him to thank Allah for having every joint of his intact. Therefore, one must praise and glorify Allah. Since a single invocation of the words mentioned in this Hadith is equivalent to one Sadaqah, one must say these words for 360 times – a number which equals the number of joints in man’s body. Moreover, to enjoin someone to do what is good and dissuade somebody from vice constitutes Sadaqah. 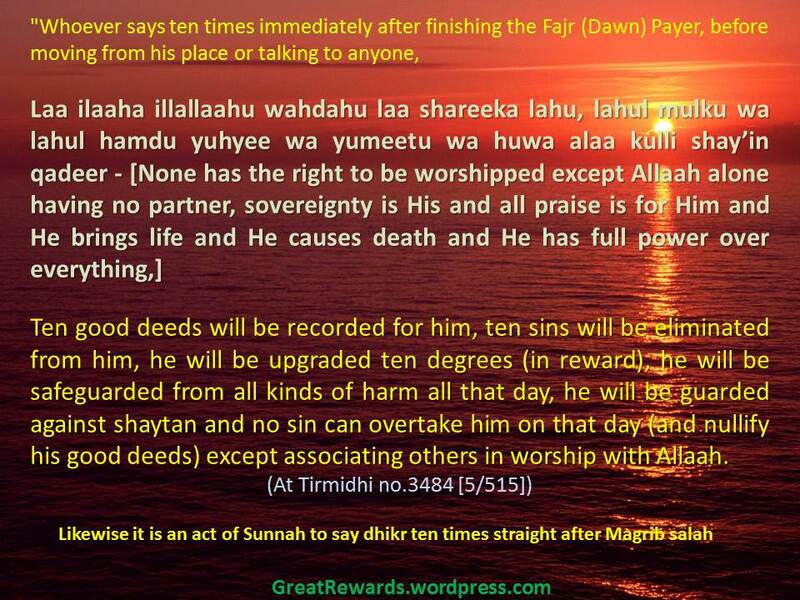 However, if one performs two Rak`ah of Duha prayer, it will serve for Sadaqah for all the joints of the body. 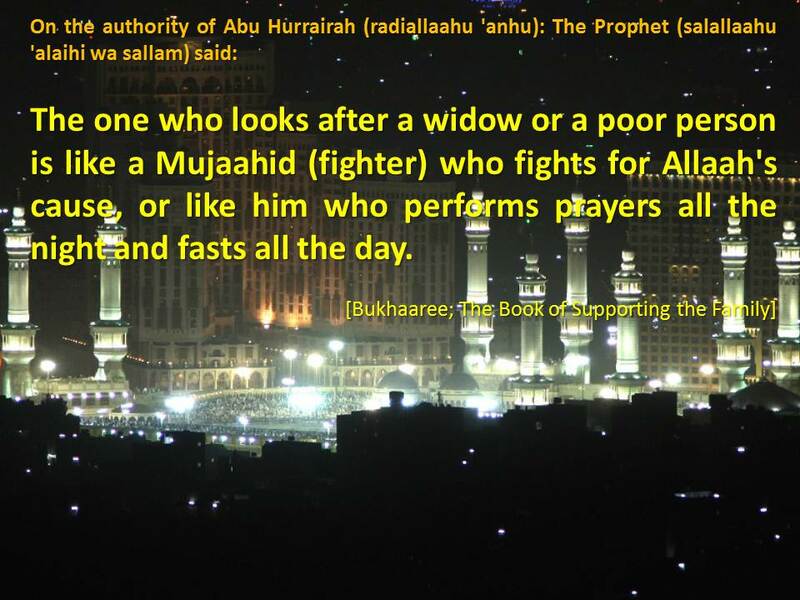 Thus, this Hadith highlights the merits and importance of Duha prayer. We also learn from this Hadith that Sadaqah is not restricted to spending money alone but also has a vast meaning and covers all forms of virtues mentioned here.